Dmitri Tcherniakov's Bolshoi Theatre production of Tchaikovsky's opera, staged at the opera National de Paris in 2008. The performers include Mariusz Kwiecien, Makvala Kasrashvili, Margarita Mamsirova and Anatoly Kotcherga. Alexander Vedernikov conducts. 5.0 out of 5 starsPerfect production. I saw this production live at Covent Garden a few years ago and was totally blown away by it. One of my favourite operas, I have seen more productions of this work than any other and seeing this I thought was almost like seeing it for the first time, Tcherniakov has stripped away all sentimentality, as Dmitri Jurowski has from the score. What we get is complete honesty and an interpretation that goes back to Tchaikovsky's intentions, making every turn in the plot logical and understandable. The cast is perfect, especially Tatyana Monogarova as Tatyana, her transition from naive young girl to sophisticated society wife is extraordinary. A word of warning, this production is not for everybody. When I saw it at the ROH I almost came to blows with my neighbour who absolutely hated it! If like me you feel that opera at it's best is total theatre, then this is for you. A very good stage production, not a pompous one. Brilliant acting. I write this as no great fan of this opera. Or, to be more correct, I am a fan of the music but normally find productions tiresome. The director of this current version clearly shares my reservations. Gone are all of those tiresome 'happy peasants' at the start and, instead, we have a Chekovian lunch party superbly done - with all of the participants acting their socks off. Top performances on the part of everybody. And the letter scene could not have been better in my experience. It is true that the director has dumped things that traditionalists might expect and look forward to seeing, but isn't that what we have come to expect of all recent opera productions? The question has to be "Does it work?" and the answer here has to be a "Yes" for the most part. Certainly the standard of acting from the company has rocketed, which certainly has to be a plus. But my response was not totally 'roses'. As a previous reviewer has mentioned, the great 'dance' scenes have gone - a disappointment to viewers who have seen the opera before and look forward to them, but of no consequence to those who haven't. But there is a slight loss - to me at any rate - in that the flirting of Onegin that resulted in the duel (or non-duel in this case) with Lensky just didn't come over in any way convincing. And I was totally confused when Onegin seemed to be pointedly ignored when he arrived at the Prince's ball/dinner-party yet the fellow guests didn't know who he was. Bad-manners all round? Probably. But let me stress that if you don't come to this opera with a baggage of expectations and, instead, 'go with the flow' you are in for a real treat. Certainly the best production available to us on DVD by a very long chalk. First the musical values. Onegin is sung by one of the opera world's rising artists, the Polish baritone Mariusz Kwiecien (pronounced, for those like most of us who stumble with Polish names, Mar-yoosh Kvetchyen) and he makes both a handsome and a handsome-voiced protagonist. He is made by the director to be more of a heel than even the libretto makes him. Tatiana is sung by Tatiana Monogarova, a beautiful young woman. Her singing is acceptable but not particularly memorable. Lensky, sung by Andrey Dunaev, is quite good. His tenor is not as rich as one might hope, but certainly more than acceptable. As for Madame Larina (Makvala Kasrashvili) and Olga (Margarita Mamsirova) the less said the better. But worst of all is the important part of the Nurse, sung with a horrendous wobble and dodgy intonation, by Emma Sarkisyan. On the other hand, Prince Gremin is sung gloriously by the veteran basso Anatoli Kotcherga. The Bolshoi chorus and orchestra do wondrously, led by Alexander Vedernikov. But the stage direction is distressing. Both Madame Larina and the Nurse are given confusing and ultimately pointless things to do by Tcherniakov. Poor Larina has to go about the stage laughing riotously (and unconvincingly) for not apparent reason. Even worse, particularly in the first act, is the silly overacting of Monogarova who is attempting to portray a naïve and gawky adolescent but comes across as simply not knowing what it is she is supposed to be doing. Again, I lay the blame for this at the feet of the director. She manages the grown-up and now-sophisticated Tatiana of the third act in much better style. Lensky's moving 'Kuda, kuda' is marred by the giddy pantomime of an old biddy who, in a two-shot with Lensky, keeps distracting from the meaning of the aria. Apparently, she thinks Lensky is flirting with her. (That's my guess, anyhow.) And what is the point of that? That we won't want to sit still and hear one of Tchaikovsky's greatest arias staged 'straight'? Talk about distrusting (and abasing) your material, Tcherniakov! And there isn't even any dancing in the great ball scene with its lilting polonaise! The stage design is silly. The whole opera uses a single set, a large country house dining room dominated by a huge dining table in Acts I and II, and the same set, now a different color and with different chairs for the table, for the Gremins' Moscow palace in Act III. The duel, believe it or not, occurs in that dining room. Lensky is not shot on purpose by Onegin but accidentally when the two men struggle for a single rifle. This is so badly staged that I had to replay it in order to figure out what had happened. It appeared to me that Lensky simply fell dead -- onto that damned long table -- without a shot being fired. This is the only production or DVD of Eugene Onegin where I didn't care a whit for any of the protagonists. True, one can read Pushkin's novel without identifying with or even much liking his main characters, but Tchaikovsky softened this (largely with that glorious music) so that one really does care for all three of the opera's main characters. There is a negligible 26-minute 'documentary' of additional material filmed during the preparation of the Paris production. This is the production that spun the Russian opera world on its head in 2006. After some 60 years with a traditional and beloved performance style dating to the 1940s, Eugene Onegin received a radical re-interpretation from Dmitri Tcherniakov that sent patrons flying off in a huff, rushing for refunds, and saw superstar soprano Galina Vishnevskaya blast the Bolshoi, refusing to participate in her 80th birthday gala for the company, saying she'd never enter the theater again. Tcherniakov sees the opera as a drawing-room drama; all the action takes place inside, around a large table surrounded by chairs. No lush outdoor scenery of the Larin's lovely country estate. No wheat fields. No large ballroom for the dances (no dancing even for the polonaise - always a loss in this greatest of ballet composers). Within these confines, however, Tcherniakov offers creative, insightful ideas, giving a fresh spin on the main characters, strongly underlying the work's psychological drama. It is provocative and idiosyncratic, and often works well, although sometimes it seems off the mark. But it is always daring, creative, sharply etched, and the acting is very fine. Tcherniakov has a way of touching the character's nerve endings that illuminates the music and heightens the drama. The opera usually works best within a traditional context, but Tcherniakov offers a valid alternative, no mean achievement, even if it shocked the Russian audiences when it first came out. Tcherniakov brings out the work's raw emotion here even more painfully than usual. The characters are often uncomfortable, on the edge - as seemingly is the viewer. The director gives most of the characters a darker persona than usual, surprisingly with the exception of Onegin, here less of a heel than usual, even in his rejection of Tatiana. We almost sympathize with him at times. Olga is usually portrayed as innocent, carefree, full of life, kind to her sister, Tatiana. Here, Margarita Mamsirova's strongly sung Olga comes off as feisty, positively catty and in-your-face, impatient with Tatiana, even nasty to her supposedly beloved Lensky. It is not surprising when Olga goes off and dances with Onegin (making Onegin not look as bad as usual); she is far from innocent here. Tatiana receives a strong, emotional performance from a first-rate Tatiana Monogarova. She is every bit the inner-focused, extremely sensitive, tortured soul, overwhelmed in her initial encounters with Onegin. In Tatiana's letter scene, Tcherniakov frees her from actual writing until the end, and Monogarova is magnificent, offering a heartfelt, emotional outpouring of great conviction, with superb dramatic acting. Her transformation from shy-eyed doe to sophisticated wife to Gremin is most convincing in the dramatic change in her appearance and demeanor. In the act three aria of her dilemma over her love for Onegin, she sits next to her husband, an unusual, daring move that comes off very well. Andrey Dunaev's well-projected Lensky comes off far more as a simpleton and a fool than the sensitive poet usually does. When he sings a love song to Olga, he reads it; one can see the air being sucked out on the stage, and a taunting Olga who then flirts with Onegin. Lensky is often mocked by the guests at the table, mercilessly so when he challenges Onegin to a dual; people just don't do that sort of thing in these modern times (Tcherniakov's costumes and bare sets evoke a modern yet timeless era). Instead of hearing gasps of horror over Lensky's jealousy seeing the here not-so-innocent Olga dancing with Onegin, he receives sarcastic jeers from the party goers. They can't believe he'd get so upset; it's just a dance, get over it. He gets no sympathy - until the previously-silent and still Tatiana comes over slowly and gently touches his face, a most moving gesture. Tcherniakov even has Lensky sing Monsieur Triquet's aria of praise for Tatiana, an unusual decision which makes Lensky look even more the fool (he sings it in Russian, not the customary French Triquet would use). Concerning the Lensky-Onegin dual, it is not even a dual; in a struggle over a gun, an accident decides their fate. An interesting take which fits during a modern time, when duals just don't happen anymore. Some of the director's ideas just don't come off, however. Tcherniakov could learn from the "less is more" school. When Lensky is singing his melancholy aria before the supposed dual with Onegin, an older woman to his left seems to sniff something from the table (cocaine?) and has a giddy smile on her face before she bursts into tears. It's hard not to watch her while we're supposed to be focusing on poor Lensky, pouring his heart out. Curious. Onegin's second for the dual enters laughing like a fool, apparently drunk. Why? It adds little, perhaps only signifying how stupid everyone except Lensky thinks the dual is. Madame Larina receives an odd although well sung interpretation from Makvala Kasrashvili (herself a former Tatiana), frequently veering from hysterical laughter to hysterical sobbing. I don't know what Tcherniakov was getting at here. She is a fairly minor character and too often draws attention to herself for no apparent reason. It comes off as disconcerting although dramatic. The glorious waltz does receive a dance, albeit from the participants at a surprise birthday party for an expressionless, non-moving, drained Tatiana, and works well. Throughout the work, Tcherniakov has a way (especially here and in act one) of getting strong, individual acting from choruses and groups which strikes one as very real. The final act, however, does not come off quite as convincingly as the first two. Onegin's tearful confession of his deep loneliness and boredom is usually sung as an aside, or to his friend, Prince Gremin, or even to a floor sweeper (Salzburg 2007 DVD). But here, after being snubbed by Gremin's ball guests during the undanced polonaise, Onegin blurts out his private confession to all the guests, seated at the table, who scorn the poor fellow. Even for a cad such as Onegin, it's unusual to think he would bare himself so in front of a group. It's even more painful to watch than a private confession. Through it all, Mariusz Kwiecien offers a burnished baritone and a convincing portrayal as Onegin. He brings a subtlety to the proceedings which is disarming (an interesting extra on the DVD shows Kwiecien and Tcherniakov frequently disagreeing on interpretation). The singing is fine throughout except for the unsteady, frail vocalism of Emma Sarkisyan's nurse, which detracts from the action. The conductor, Alexander Vedernikov, a well-known former bass-baritone, acquits himself well on the podium, offering an idiomatic, emotional reading. Tcherniakov is the propelling force here, however. This would not be an outright first recommendation; the glorious 1985 Kirov DVD with Sergei Leiferkus, Tatiana Novikova and Yuri Marusin will likely appeal to a greater audience, although the picture now looks dated. But for an exciting, extremely provocative alternative, Tcherniakov sheds a new and highly thoughtful light on this ever-fresh work. Well, I have to disagree with both of the previous reviewers - i've seen this production twice live, in Beijing and London, and I own this DVD, and I think, while the approach is controversial, the perception and depth that the director invests in the characters is extraordinarily nuanced and, unlike so many concept productions, thoroughly grounded in musical logic, even if it goes against the letter of the original mise-en-scene. 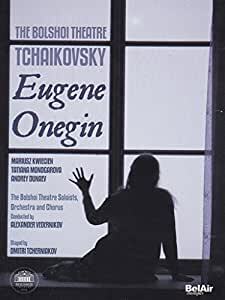 Tchaikovsky's 'Onegin' lacks the sharp social satire and cold eye of Pushkin, but instead shows itself to be akin to the ambiguous theatrical style of Anton Chekhov (one of the great lost works was a possibility of Chekhov and Tchaikovsky collaborating on an opera together). The conceit of the action taking place around a large family table works wonders for the discursive first scene - where the big folky chorus - which so often seems like an interpolation from another piece, here is seamlessly integrated into the action. And as for Madame Larina being hyperactive - I see it as a tour de force, illuminating a rather dysfunctional relationship with her two daughters, who are so contrasted. I was riveted from beginning to end each time I witnessed it live, and while it is not the only version I would wish to see, as 'Onegin', like a Chekhov play is multifaceted and open to all sorts of interpretations, it is a bracing reminder that opera at its best is not about divas and loud high notes, but a true synthesis of emotion and drama. Such is the conviction of this performance that the ins and outs of the singers become irrelevant - yes, I'm sure you can be nit-picky and find better individual performances among the singers in comparative versions, but I can't remember seeing a production of this piece that is so theatrical, psychological and compelling. Certainly the recent Met DVD with Renee Fleming and Hvorostovsky though very good, doesn't have a fraction of the voltage on display here. Thoroughly recommended.